The term micro-influencer is a marketing buzzword that has been gaining a lot of traction recently, but the ability of micro-influencers to make an impact with customers is anything but “micro”! Nowadays it’s easy to learn about trends and get product recommendations from our peers via social media. Micro-influencers are regular everyday people who have built an engaged social media following due to the content they post. Because of the great engagement they see with their followers, micro-influencers can have an immense amount of influence. Number wise, a micro-influencer has between 10,000-50,000 followers on social media. Although they are still thousands (if not millions) of followers away from that of a celebrity influencer, they actually drive stronger engagement on their posts. 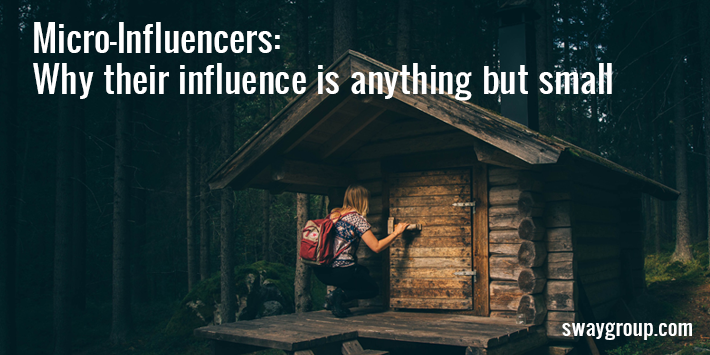 Due to the fact that micro-influencers are regular people sharing their personal experiences and opinions, their posts come across as authentic, relatable, and resonate highly with their followers. Micro-influencers are like “your BFF sharing information about her favorite new product”, Entrepreneur. You trust their opinion as you would your best friend’s – and that is why they drive engagement and, best of all, action. But don’t just take our word for it! Research on Instagram has shown that as the number of followers increases, engagement rates fall. So while working with an influencer with over 1 million followers may sound like a marketer’s dream, the reality is that influencer’s posts have a “like” rate of only 1.7%. Users with 1K-10K followers have a rate of 4% and 10K-100K have a rate of about 2.4% (and comment rate follows a similar pattern). Plus, micro-influencers have a more targeted audience. People typically follow them for specific subjects or types of content, such as quick hands-free recipe videos or fashion trends. When you’re trying to get the best ROI, working with the right micro-influencers may be the most effective strategy. …Why are we calling them “micro” again? Micro-influencers drive higher engagement and provide more authenticity than celebrity influencers, all while reaching a more specific audience. They should be considered anything but micro. How about super-influencers? Engagement wizards? Action drivers! Okay, we’ll stop, but let’s get real – a micro-influencer’s impact is anything but micro. The next time you find yourself thinking about a way to make a huge impact with your customers, you may need to think a little micro. Thinking about incorporating influencer marketing into your strategy?